By definition, chiropractic care encourages your body to heal itself by bringing it back into alignment. And by doing your part, you can make the lifestyle changes that prevent the conditions that brought you to the doctor of chiropractic in the first place. Eat better. Become more active. And, in keeping with the Foundation for Chiropractic Progress’ theme for May, practice good posture. In olden days, proper young ladies would walk for hours balancing books on their heads, perfecting their posture. But times change and, with technology keeping us hunched over our laptop for hours on end and continually checking our mobile devices, we’ve lost our natural curve. Whether you call it tech neck or millennial hunchback or a pain in the neck, doctors of chiropractic are seeing it show up on younger people these days, and it raises more than aesthetic concerns. • By allowing more room for your lungs and diaphragm to expand, you can optimize your breathing and circulation. • Keeping your bones and joints in correct alignment allows your muscles to be used as they were meant to be, properly and efficiently. It also reduces the abnormal wearing of joint surfaces – think knees – that can lead to degenerative diseases. • You’ll decrease stress on soft tissues, too, giving ligaments, muscles, tendons and discs a welcome break. 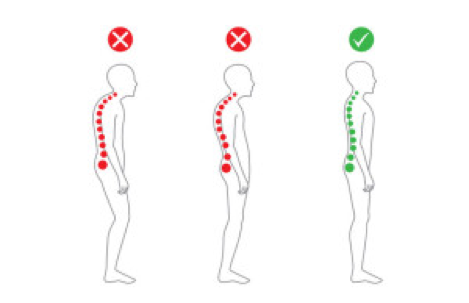 Additionally, your spine won’t become fixed in an abnormal position. • Finally, it boosts your mental well-being, boosting your mood and simply making you feel good about yourself. • Get rid of the slouch. Use the 90/90 rule when sitting in a chair, keeping your elbows and knees at 90-degree angles. Hold your mobile devices at eye level when checking your messages. And whether you’re working at your desk or watching television from the couch, take a few minutes each hour to limber up. • Scrap the high heels or at least reserve them for special occasions. The same with heavy handbags and over-filled backpacks, notorious for pulling your body in unhealthy directions. • When sitting at your desk, keep your head and neck aligned above your shoulders. Put your feet flat on the floor and your back against the back of the chair. As a study proved, the best results come from a collaborative effort. In this particular case, 30 women between the ages of 20 and 39 were divided into three groups and each was taught how to sit and stand correctly. The first group received spinal manipulative therapy on restricted thoracic spine segments; the second, the therapy as well as stretch and strengthening exercises and the third, stretch and strengthening exercises alone. All improved their posture, but the second group saw the best results and decreased their curvature of the spine. Where do you stand? It’s up to you! Military life requires many physical challenges. The physical stresses of carrying heavy loads, running with body armor and jumping out of planes can often have a long-term impact on a person’s body. It shouldn’t come as a surprise that many Veterans suffer from chronic pain from the lingering effects of active duty. Of the millions of patients served annually in the Department of Veterans Affairs (VA) facilities, more than half experience chronic pain. Much of the chronic pain reported by Veterans is musculoskeletal pain, with around 25 percent consistently reporting low back pain (LBP). The prevalence of severe pain is more common in Veterans with LBP than in non-Veterans. Chiropractic care – a safe, effective and non-pharmacological approach to manage pain, as well as general health and wellness – should be an increased part of the integrated care that Veterans receive for LBP. Luckily there is hope. A Department of Veterans Affairs policy enforces that Veterans have access to chiropractic care, but this service is dependent on the availability of doctors of chiropractic (DC) on staff at VA facilities. The VA now provides chiropractic care at approximately 75 major VA treatment facilities within the U.S. Unfortunately, most of America’s Veterans still do not have access to chiropractic care because the VA has yet to provide DCs at a vast number of its medical facilities. The Veterans Health Administration is the largest integrated health care system in the United States, providing care at 1,243 health care facilities, including 170 VA Medical Centers and 1,063 outpatient sites of care of varying complexity (VHA outpatient clinics), serving more than 9 million enrolled Veterans each year. There is currently an effort to require the VA to provide chiropractic care to all its medical treatment centers by the end of 2020. Efforts to expand chiropractic care to Veterans has recently gained new steam as ranking members of the Veterans Subcommittee on Health have thrown their support behind H.R. 103, the Chiropractic Care Available to All Veterans Act. The bill would require chiropractic services to be offered at all VA medical centers and include chiropractic care as a standard benefit for Veterans using the VA. Companion legislation is in the Senate. Furthermore, chiropractic care in the VA is expanding beyond just spinal manipulation. Recently, President Trump signed into law the Job for Our Heroes Act, which includes a provision allowing DCs working within the VA to perform physical exams on Veterans needing a medical certificate to operate a commercial motor vehicle. Prior to the legislation, only 25 medical doctors within the entire VA healthcare system were qualified to perform the Department of Transportation (DOT) physical exams. Providers in the National Registry of Certified Medical Examiners—including more than 3,500 DCs—were excluded from providing the exams to truck drivers who receive their care through the VA health care system. Consequently, the drivers were burdened with limited access and were forced to look outside the VA for eligible health professionals to perform the required physical. As additional proof that chiropractic care is vital to Veterans, a consensus-based, integrated care pathway was recently designed for DCs, primary care providers and mental health professionals who manage Veterans with LBP within VA healthcare facilities. The purpose of this chiropractic integrated care pathway was to define the parameters of an appropriate approach incorporating mental health and chiropractic considerations in the primary management of patients with LBP. Since mental health conditions are common among VA patients, DCs, while providing LBP care, may identify changes in a patient’s mental health status that could require additional follow-up. Although this care pathway focuses on LBP management, it also includes an overview of common mental health issues that a patient may present while receiving chiropractic care. Through providing treatment for LBP, physical exams and as another touchpoint for mental health, DCs are in a perfect position to help Veterans and should be included as part of the integrated care team.